15 year old Julie Beaufort-Stuart knows that her life is about to change in many ways: the family estate has been sold to pay debts. This will be the family's last summer spent at the old castle -- and they will be surrounded by workers and strangers busily changing over the traditional home into a boarding school. Even so, Julie never expected to get banged on the head and left for dead by the side of the river. Part coming-of-age story, part murder mystery, part historical tale, part exploration of the culture of Scottish Travellers ("gypsies" is an impolite term), this book is a page turner from beginning to end. 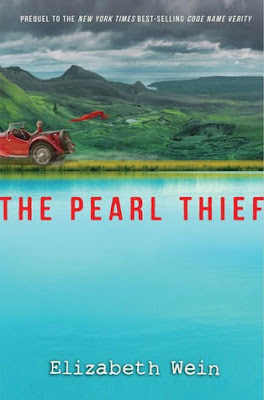 It is also, astute readers will note, a prequel to this author's award-winning Code Name Verity, and many of the scenes in Pearl Thief add light to scenes and situations in the other book. Highly, highly recommended. I am perishing to hear the audio version.